Rojulu Marayi, a different love story from a passionate team is on its way to create a laugh riot. The movie has undergone censor clearance with a U/A and is all set to release on July 1st. It has been creating positive buzz even before its audio release. Dil Raju and Maruthi's association was a boost for this film. 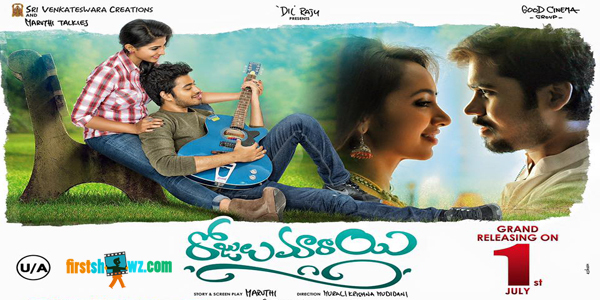 Starring young talent like Chethan, Parvatheesam, Tejaswi and Krithika in the lead roles, the story of Rojulu Marayi was penned by Director Maruthi. Music by JB was an instant hit. Directed by Murali, an associate of Chandrasekhar Yeleti, the movie has shaped up well. Censor board members are happy with the laughs spread by this love story and have appreciated the team for their good work. ROJULU MARAYI is presented by Dil Raju on SVC banner in association with Maruthi on Maruthi Talkies Banner and produced by G. Srinivas Rao on Good Cinema Group banner.